Teaching staff at three schools in Newham, east London, have been taking strike action due to the schools' governing bodies forcing through academisation. Striking staff have been actively backed up by parents, students, the local community, their union the NEU and the Socialist Party. Newham NEU members have just elected a new branch secretary. Louise Cuffaro is the rep at one of the striking schools (Avenue) and a Socialist Party member. In February people from the three striking schools rallied outside the town hall. Feeling the pressure councillors voted in support of an anti-academy motion. 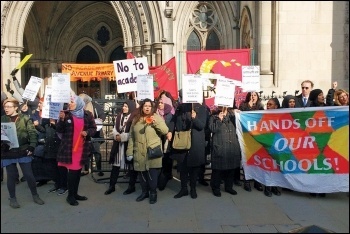 Avenue school's transfer to an academy chain is "on hold" after a legal challenge by the parents. The governors were days away from voting to become an academy. The success means that vote and the process of academisation has been temporarily halted. The legal case challenges the lack of meaningful consultation about the transfer. Many parents believe the refusal by the school to organise a parents' ballot is because it would be a resounding no to academies. An insufficient survey of parents last year found 132 against academisation, with only four in favour. Keir Hardie school (named after the Labour Party's first socialist leader) has reversed its academisation decision. The NEU had escalated strike action there. It's clear that the governing bodies of others schools in the area have taken note of the strikes and the campaign. It's likely to have influenced Brampton school governors to make the decision to remain in local authority control rather than transfer to academy status. However, all the recent victories do not mean that the fight for these striking schools to remain in local authority control has been won. Strikes are key to ending academisation. We need to do everything possible to support those on strike and to ensure a permanent victory. Although the council did vote through the anti-academies motion, some councillors disgracefully abstained or voted against it. Socialist Party members in Newham will be challenging these councillors in the local May elections by standing as part of the Trade Unionist and Socialist Coalition (TUSC) candidates. Local people can choose to vote for genuinely anti-academy and no-cuts candidates. TUSC has chosen not to field candidates against genuine anti-academy Labour candidates that have been showing their support in both words and deeds by attending picket lines and supporting the demand for a parental ballot. The Socialist Party also demands that the current council executive accepts the council vote and the outgoing mayor Robin Wales confirms that council policy has changed and it now rejects academisation. Governors make the decision to transfer to academy status but there is still lots anti-academy councillors can do to help striking teachers and the parents that object to academies. Just a vote for an anti-academy motions is not enough. Council propaganda already plasters the borough. Why not push for funding for anti-academy banners to be displayed? It would make it very clear where the council stands on the issue. They should also contact governors in partnership with the NEU and organise meetings between governors and the staff and parents who oppose academisation to ensure the governors properly listen and act on parents and teachers wishes. The council can call local referendums. Anti-academy councillors should demand this on the issue of academies so that the community has a democratic say in how their schools are run. Finally they can call on the Newham Partnership Working (NPW), which runs outsourced education support services, to follow the new council policy on academisation. The NPW's board contains three staff appointed by Newham Council so they should follow the direction of the council and aim to stop academisation in Newham. For Whom the School Bell Tolls: Our kids or the Tories? Southampton asks "What will you do to stop education cuts?"